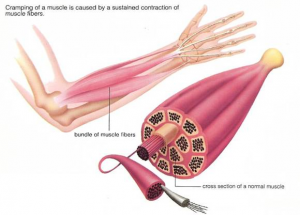 A muscle spasm is an involuntary contraction of a muscle, and is frequently painful. There are many different types of muscle spasms. Spasms can often be addressed through chiropractic care, improvement of diet or physical therapy. Some causes of muscle spasm include straining of a muscle, dehydration, trauma, and damage to nerves or to the spinal cord.A pinched nerve is caused when a nerve is somehow damaged or injured by direct pressure or compression and is unable to properly conduct its signal. There are many potential causes for a pinched nerve, depending on the location of the nerve. A pinched nerve in the neck or lower back can be caused by a herniated disc, arthritis, bone spurs, or spinal stenosis. A pinched nerve in the lower back or buttock can compress the sciatic nerve, which can cause sciatica. A pinched nerve in the wrist can be caused by carpal tunnel syndrome. Cubital tunnel syndrome is a similar condition caused by compression of the ulnar nerve in the elbow. Both of these conditions are more common in people with diabetes and people who perform repetitive activities such as a typist, using a computer keyboard for long periods of time, or assembly line workers. Swelling around a nerve can be caused by an injury, bruise, or other conditions, including the swelling of the extremities that can occur with pregnancy. If one frequently gets cramping of this sort, this may be the result of poor nutrition, or too much exercise. Frequently at the end of a marathon, runners may be seized with a painful muscle spasms because their body is depleted of essential electrolytes. Excessive nausea and vomiting can also cause a muscle spasm. Another type of muscle spasm that may occur is cramping of the stomach. This may be associated with either a stomach flu illness, or with conditions like irritable bowel syndrome (IBS). This cramping is also quite painful, but gradual control of IBS can reduce frequent muscle spasm. Infants with colic often experience muscle spasm in the abdomen as well, hence the excessive crying. This is often a brain’s immature response to digestion, which is why many children with colic improve as they age. Soft tissue manipulation is another common technique used when treating muscle spasms. Treatment can include therapeutic stretching and massage therapy. These types of treatments help to reduce fluid, reduce scar tissue and provide relief for muscle spasms. The chiropractor may also use associated therapies for the treatment of muscle spasms. This can include hot and cold treatments, electrical stimulation of the affected muscle or ultrasound. These therapies help greatly to increase circulation to the muscles and also prevent swelling of the muscle and prevent scarring. Associated therapies very often reduce pain and are a means for prevention of further injury and injury recurrences. Of course the ultimate goal is to reduce the muscle spasm. Very often chiropractors will also recommend some strength training exercises and stretching moves for you to do in between visits.